We recently began to stock 6 gauge 4″ x 4″ Welded Wire for handrail infill. It is American made. We are Stocking 8′, 12′, and 20′ lengths. 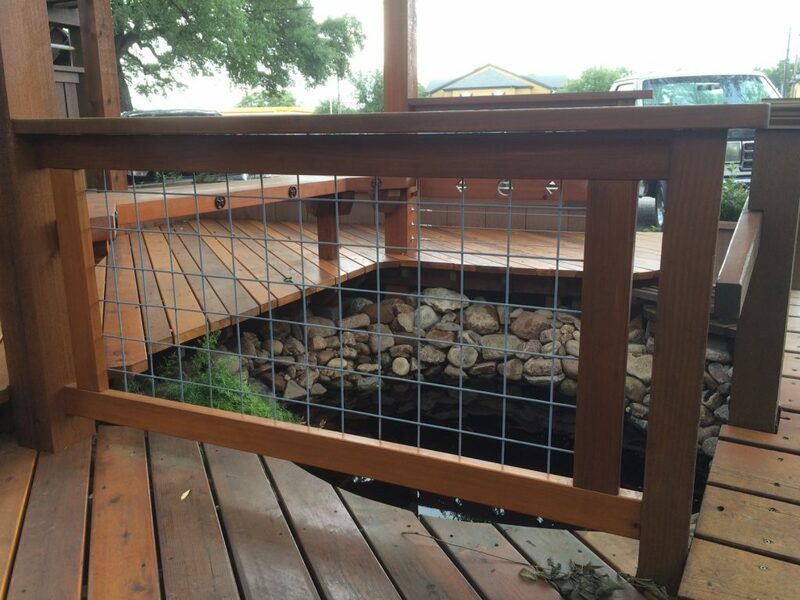 These panels can be utilized in a variety of applications, from deck railing to ranch fences, or even vegetable garden trellises. 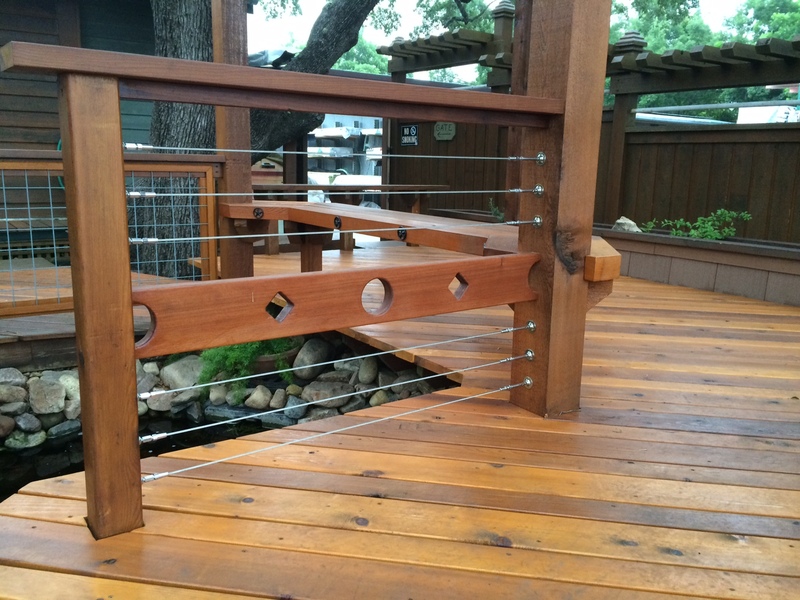 Atlantis Rail Systems offers a stainless steel cable rail system that is attractive and durable, as well as, simple to install. 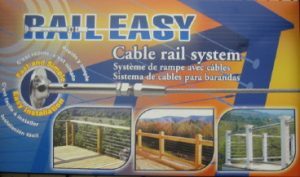 The Rail Easy system incorporates easy to use components and a simple 3 step installation. Click on the above image to see the installation instructions. 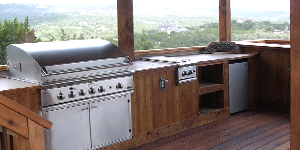 Deckorators and Solutions offer a variety of designs for any style or taste. 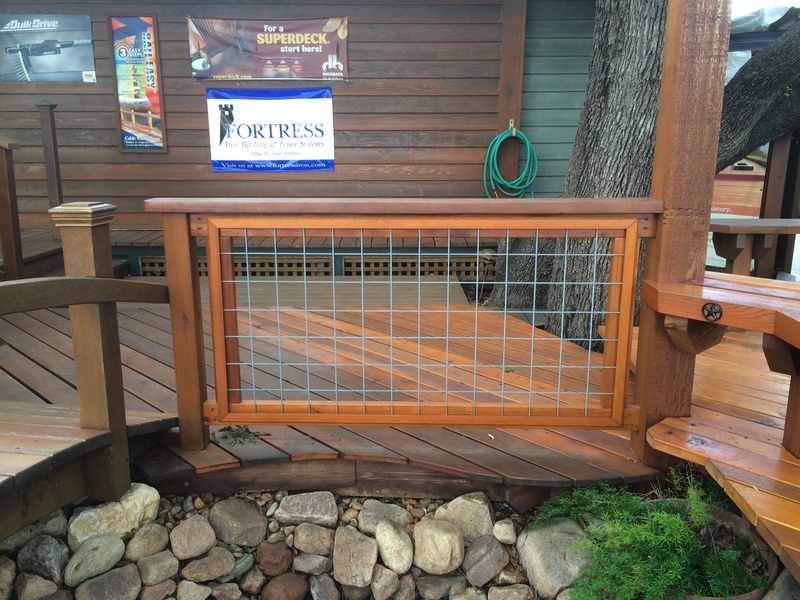 The powder coated aluminum means none of the upkeep that comes with traditional 2″ x 2″ wooden balusters. You will still be able to achieve that traditional look with the Classic Balusters, which are available in stock in five different colors. Installation is made simple with either the hidden or decorative connectors. If you are looking for something more elegant, we also keep the Architectural Balusters in both styles and colors. The rail connectors also make attaching the rails to the posts a breeze. 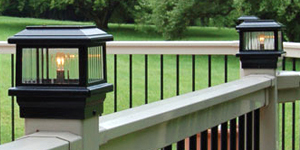 Deckorators offers options that we do not stock, such as the Colonial, Scenic, and Traditional balusters, which we are glad to special order. 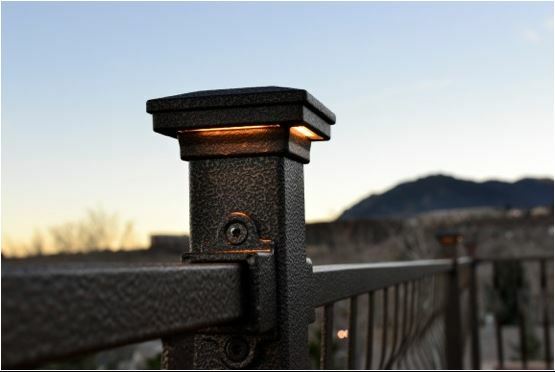 We stock Fortress Accents deck lighting. 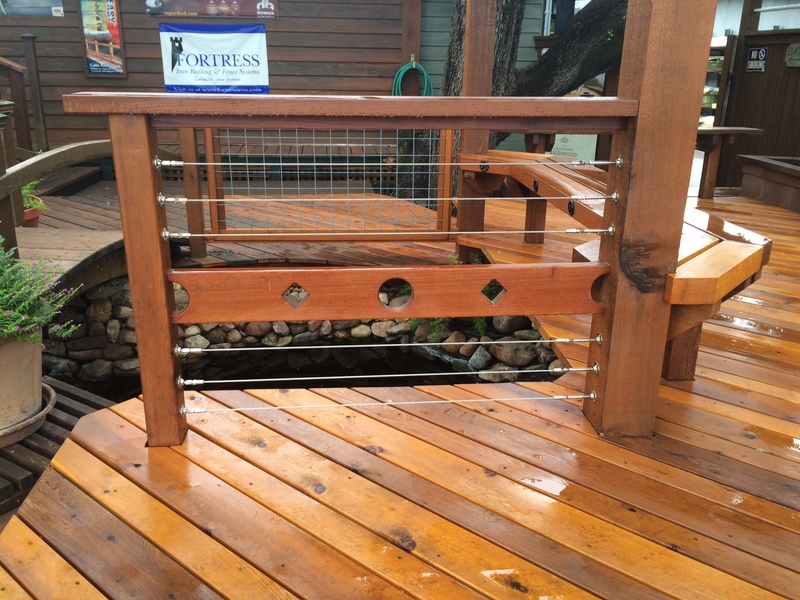 It is a low voltage system that can be incorporated into either a Fortress handrail system or any wooden handrail project. It is a sleek and easy to use system. 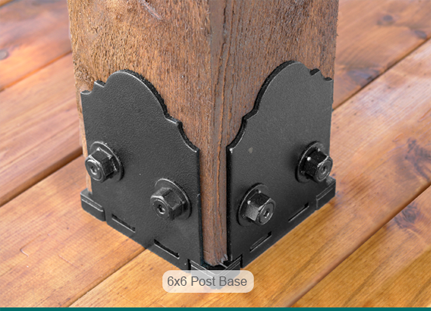 Another great finishing touch to a deck rail or even a decorative fence is adding decorative post caps. They are available in a variety of styles. We stock six different cedar post caps for 4×4 posts including three cedar caps, a copper top, and black or white tops. We also stock a pyramid cedar cap that fits 6×6 posts. Post caps are both decorative a functional. They help extend the life of your posts by protecting the endgrain where most moisture is absorbed. 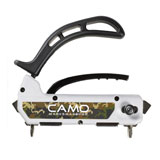 Camo Hidden Fastening System – We stock the Camo Marksman Pro. 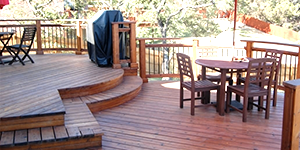 This tool works for most decking materials: cedar, redwood, Camo Marksman Protreated pine, hardwood, and composite. It is contractor-grade, and DIY priced. It was one of the easiest and most economical hidden fastening systems you’ll find. An added plus is you can remove a single board if you need to since you have access to the screws. 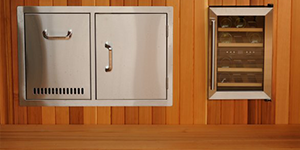 It also automatically sets a 3/16″ space, which is important for drainage and ventilation. 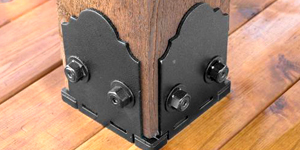 There is finally an option for wood connectors that are both decorative and structural. 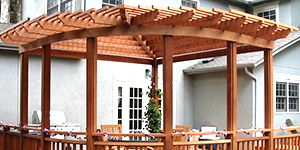 Ozco Building Products has come out with the OWT line that offers a galvanized and powder coated connector that offers a rustic look to Pergolas and Patio Covers, or any other outdoor project you can imagine. Stop by and see all the options, and our display out front. 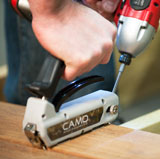 Quik Drive – For the professional that installs a lot of decking there is one essential tool to have. Quik Drive auto-feed screw driving QuikDrivesystems are ideal because they feature quick-loading screw strips, precise countersink adjustment, and a patented auto-advance mechanism. 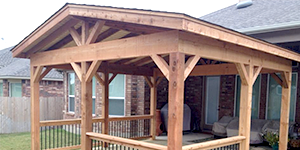 You can improve the quality and durability of your work while reducing time and money spent on the job. When you come into Braundera you will find the most commonly used exterior screws in stock. We keep Quik Guard Coated Bugle Head, Quik Guard Coated Trim Head, and Composite screws. 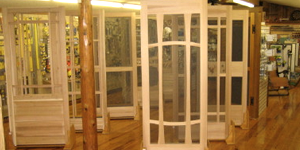 Sizes range from 2″ to 3″. GRK Fasteners – If you have not used a GRK screw, it is time to try one. 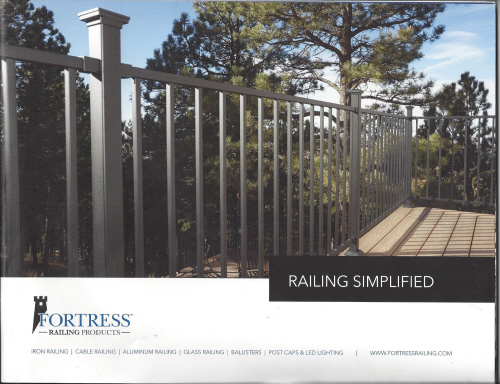 We stock the RSS structural lags. They have higher shear strength than that of larger traditional lags and there is no need to pre-drill. These are hard to beat. We also stock the R4 multi-purpose screws in lengths ranging from 1 ½” to 6 3/8”. The newest addition to our GRK fasteners are the trim head screws. These are available 1 1/2″ to 3 1/8″ in length. The Climatek coating used on these fasteners is the most advanced of its kind. 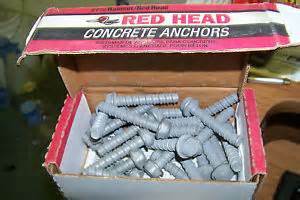 Concrete Anchors – You can find a broad range of concrete anchors at Braundera. We keep a good range of sizes in both Wedge Anchors and Sleeve Anchors. We also stock a good selection of standard Tapcon screws, as well as a range of sizes of Redhead LDT’s (Large Diameter Tapcon) screws. If you have not tried the large version of the standard Tapcon screw, you have been missing out on a versatile fastener. Duo-Fast – We keep this brand of pneumatic fastener both for the quality they offer and the variety. Not only do they make a high quality nail gun, they also offer fasteners to fit all of the other leading brands. We stock nails to fit most brands of nailers used, including Paslode and Hitatchi. Acorn Mfg. 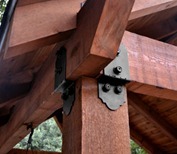 – Acorn hardware is made of forged iron and offers a rustic and unique style to any home. We stock a variety of gate hardware and have access to a wide range of builders’ hardware to suit any project. These hammered iron hinges and latches provide the strength required to hold even the heaviest built gates and doors. 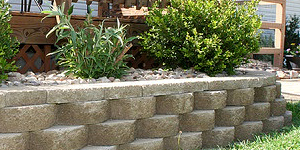 If you are planning on doing some gardening or landscaping, you are probably considering your options for building materials. 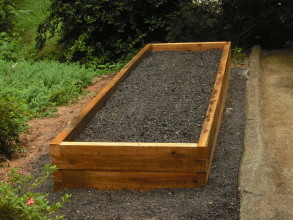 Whether it is a vegetable gardening or flower bed you may be looking for an alternative to treated pine. 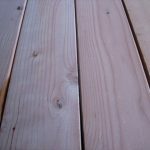 Both Cedar and Redwood are great choices for edging a flower bed or constructing a raised planter. They do not contain any chemicals or preservatives that may leach into the surrounding soil, so they are safe to use near plants that bare fruits and vegetables. 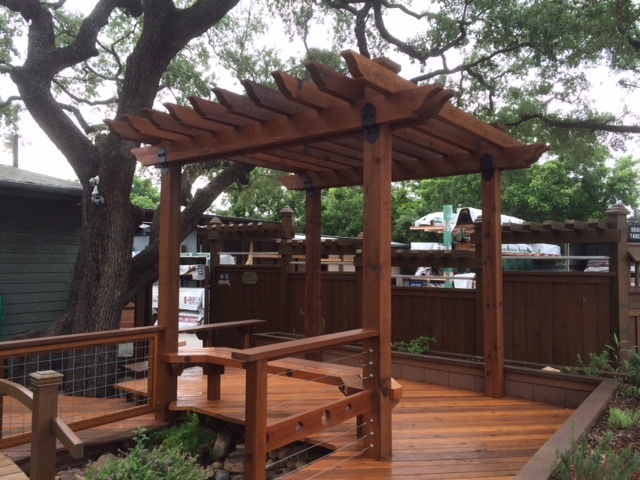 Another reason these two types of wood make a great choice is that they are naturally bug and decay resistant. Also, they will not twist, warp, or crack after they have been in the ground for a while. Either of these choices will last and be enjoyed year after year. 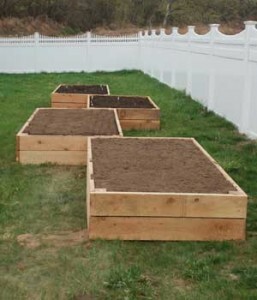 Below are a couple of examples of raised garden beds that can be easily built. If you have a size in mind and would like to know the cost for materials you can stop by, or call, and we will be happy to help you come up with the necessary material list. We have all the lumber and hardware in stock. We are now stocking a selection of plywood products. See below for a list of types and grades. 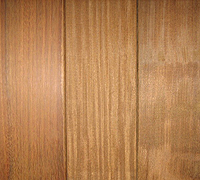 We are stocking 1/4″ Red Oak Plywood. It is an A-3 grade. Along with the Oak plywood, we have also brought in some Radiata Pine ACX Plywood. These are available in 3/8″, 1/2″ and 3/4″. If you need a clean sanded face with no voids this is something to look at. We have also brought in a 1/4″ Luan Plywood with Okoume on both faces. This is an inexpensive plywood with many uses. Its clean face makes it great for a backing material on bookcases and other furniture, or can easily be cut into small pieces for building any number of projects. 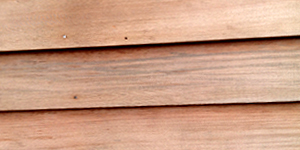 This is the most common and widely functional construction grade plywood. It is available in both 1/2″ and 3/4″ thicknesses. 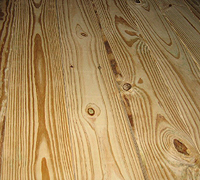 It is most often used for subfloor or sheathing material, as well as for roof decking. 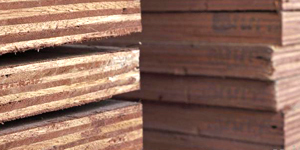 We are stocking a BC grade of treated plywood. This is a better grade than you will usually find at most lumber yards. 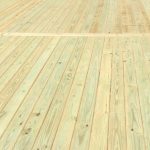 We choose to stock a better grade because even though you may need a construction grade of plywood that is pressure treated not to rot, you may also need it to have a clean, sanded face. 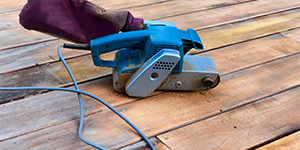 Most often for flooring material in sheds, but there are dozens of applications. We are stocking 1/2″ and 3/4″ sheets. 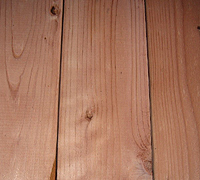 This plywood is most often used, as the name suggests, for soffit material. 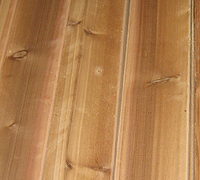 The rafters on the underside of eaves on houses, as well as sheds and covered porches, are usually covered by this type of plywood to give a clean finish when being painted. We stock the Premium grade, which is the better of the two grades available. 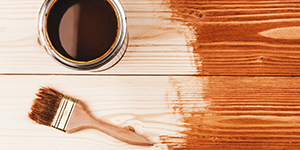 In the right application it can also be stained as it is a clean grade. This is a versatile plywood with a rough texture. 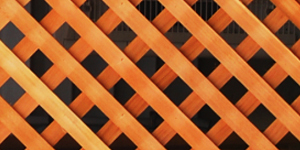 It is similar to the Pine Soffit Plywood above, but with Okoume on the face. 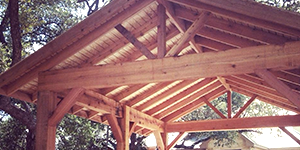 This give you the ability to have your soffit, or porch ceiling, stain up to match the surrounding Western Red Cedar lumber being used. 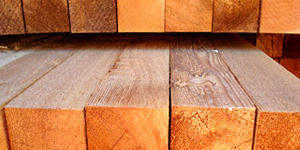 The Rough Okoume face has a very similar appearance to Rough Cedar. Many times this is installed as a first course of roof decking when exposed rafters are desired.